One evening I was sprinting to catch a city bus, tripped, and smashed the back light for my bike. After that I was using some electric glow sticks for front and back lights on my bike for a while. Finally I found some bike lights at the local Dollarama, so I got the pair. When I tried to install the bike lights the mounting clips broke off. 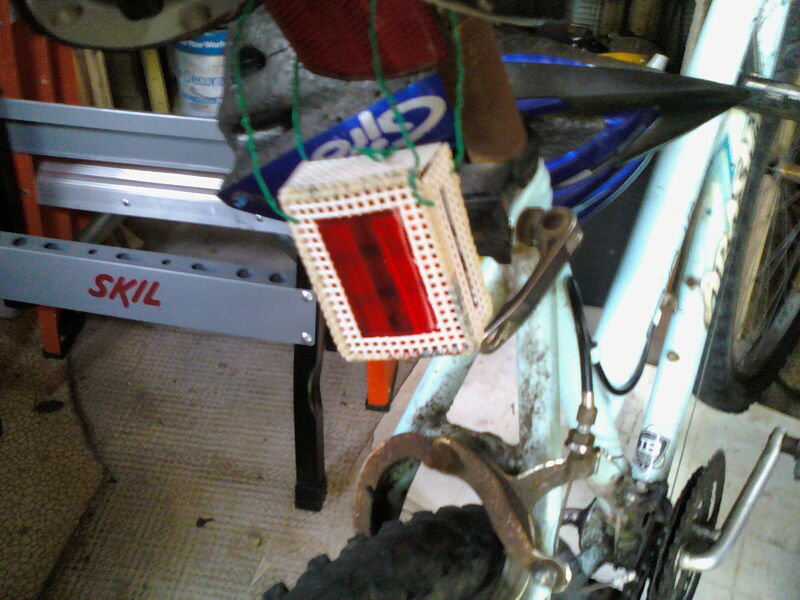 Being a person who does crafting with things like plastic canvas this only drove me to find a way to make a mount to put them on my bike, since the lights themselves still worked fine. The end result was a little box, held closed with a twist tie, attached to the bike with twist ties, holding the light part of the Dollarama bike lights, and they are working quite well. The picture is the rear light, and the front light is basically the same. Total cost to me: about $3 and about an hour. I am also looking for cheap bike lights. If you have any resources than please share it here. I can pay $3 for it. I have check some on a website you can check it out here.